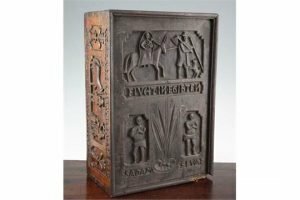 A 16th century style German carved fruitwood bible box, decorated all over with biblical scenes including the Flight into Egypt, Adam & Eve, etc. 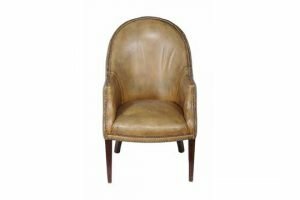 A mahogany and studded green leather upholstered armchair in George III style,20th century, the tapering high back above shaped arms, the bowed seat on square section tapering legs. 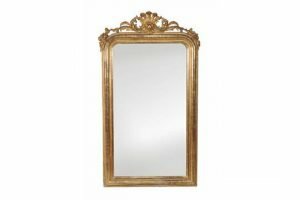 A French giltwood and composition pier wall mirror, late 19th century, with pierced, leaf scrolled and floral crest and moulded frame. 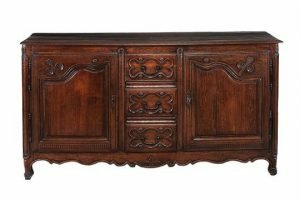 A Louis XV oak cupboard with a central bank of three drawers, backed on either side by a panelled cupboard door, each carved with foliate motifs, the waved apron above squat cabriole legs. 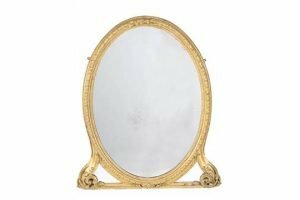 A Victorian carved giltwood and composition wall mirror, circa 1870, the oval central plate within a bead and leaf decorated frame, a pair of shaped triangular mirror panels beneath, within a scroll decorated frame. 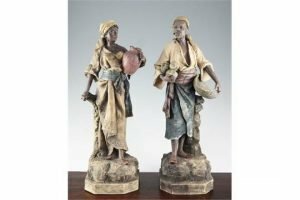 A pair of Austrian painted terracotta figures by Johann Maresch, modelled as male and female arab figures, on a naturalistic bases, impressed marks. 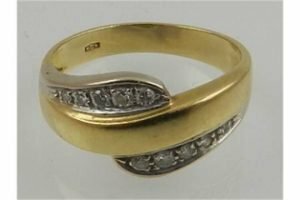 A 14 carat yellow gold and diamond set crossover style ring, having ten graduated round cut diamonds. 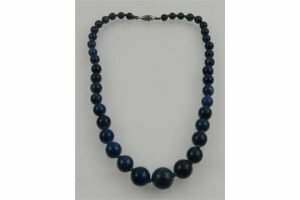 A lapis lazuli necklace of round cut graduated beads, having white metal clasp. 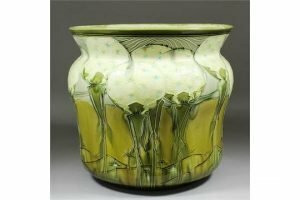 A large late 19th Century Minton glazed pottery jardiniere, the sides moulded with dandelion clocks. 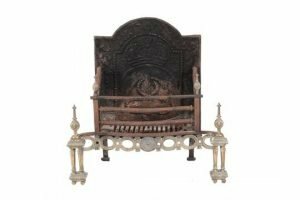 An iron and brass mounted fire grate, in the 17th century style, 20th century, with arched backplate above a three rail serpentine front basket, with twin projecting uprights of four brass open columns and flame finials. 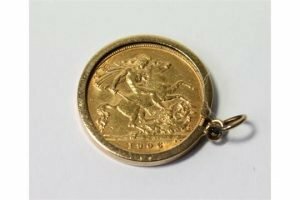 Half sovereign, 1906, in 9ct gold loose mount. 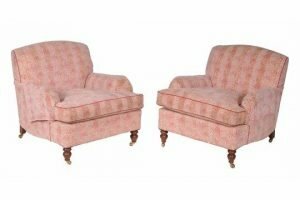 A pair of mahogany and upholstered armchairs, each arched back above downswept arms and a loose cushion seat, on turned tapering legs and brass casters at the front. 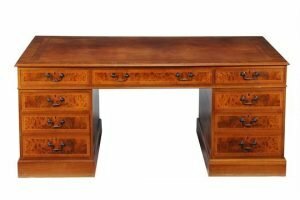 A walnut and burr walnut partners desk in George III style, the gilt tooled leather inset top, each side with three frieze drawers, each pedestal with a cupboard door opposed by a drawer above a filing drawer, fronted by false drawers. 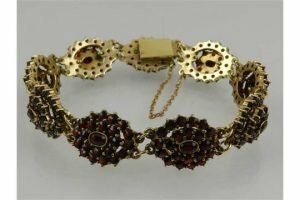 A mid 20th century yellow metal and garnet cluster bracelet, bearing indistinct mark to clasp. 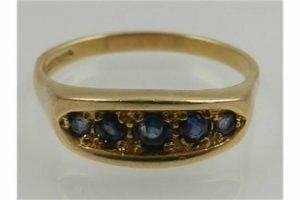 A 9 carat yellow gold and sapphire graduated five stone ring. 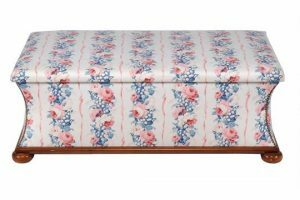 A mahogany and upholstered ottoman in the Victorian style, 20th century, the hinged lid opening to a void interior, above a moulded plinth and turned feet. 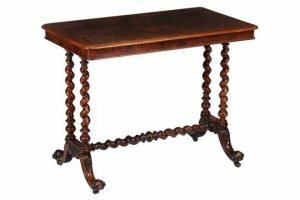 A Victorian walnut side table, the figured quarter veneered top above moulded edge and frieze, above spiral turned uprights and a stretcher, above scroll carved downswept legs, brass caps and ceramic casters. 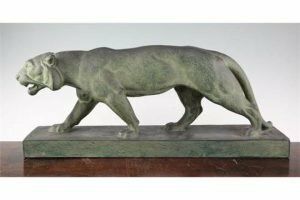 A French Art Deco painted terracotta figure of a panther, on rectangular plinth base. 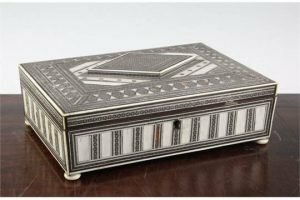 An Indian ivory and sadeli rectangular work box, the lid with raised lozenge panel opening to reveal and internal mirror and various compartments and fittings, on squat bun feet. 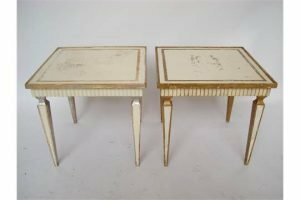 A pair of early 20th century French gilt and white painted gesso beechwood, square low occasional tables, each with fluted frieze on square tapering legs.